Nothing illustrates a well-trained horse better than a seamlessly executed flying lead change. Being able to cue the horse and have him effortlessly switch leads is the ultimate in body control and collection. In this in-depth series, Clinton breaks down the process of teaching lead changes into manageable steps that build on one another. Working with a variety of horses at different stages of the training process, Clinton illustrates not only the how-to of teaching lead changes, but he also addresses common problems and offers success tips. You’ll be amazed at how easy it is to teach flying lead changes when you follow Clinton’s method. The digital Leads and Lead Changes video series may be accessed on your mobile device using the Downunder Horsemanship app, which is a free download from the App Store and Google Play, and on your computer through the Downunder Horsemanship website. Much of the frustration involved with lead changes can be nipped in the bud by thorough preparation. 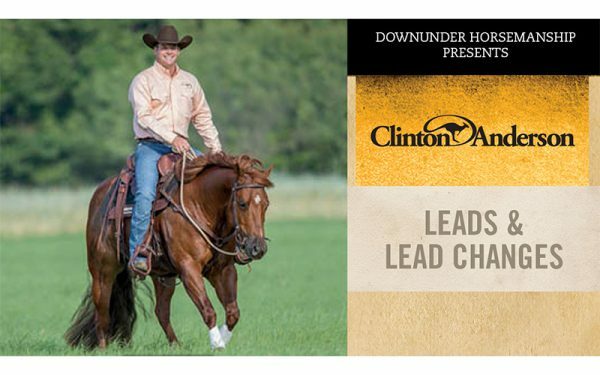 Clinton demonstrates in detail the foundation he puts on his horses before addressing the topic of lead changes and provides practical, must-do exercises to set your horse up for success. Working with three separate horses, Clinton demonstrates how to begin asking a horse to change leads. You’ll see the good, the bad and the ugly. No part of the horse’s learning process is hidden from the camera. The disc also includes a student lesson in which Clinton helps a rider teach lead changes. The lesson provides valuable troubleshooting advice. Moving beyond the basics, Clinton explains how to progress and fine-tune a horse’s ability to change leads. He works with five horses that are more advanced in their training and offers fixes to common problems that are likely to crop up. By the end of the disc, you’ll have the know-how to train your horse to change leads off a feather-light touch.